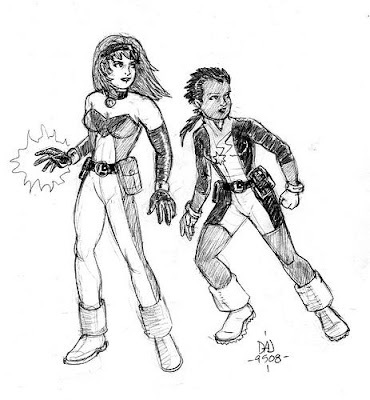 My two favorite Legionnaires from the post-Zero Hour period, Kinetix (Zoe Saugin of Earth) and XS (Jenni Ognats of Earth, granddaughter of Barry Allen), as drawn by the life of the comics bloggysphere party (and Zoe Saugin FanMan #1), Johnny Bacardi! I dig this piece a lot, and rest assured, JB, it will reside in a place of honor here at Trusty Plinko Stick World Headquarters. Thanks so much! And people, the man looks to be willing to take on more commission work, too. He says as much over on his LiveJournal site, where he also reminds people that he's "disgustingly cheap... and [doesn't] charge much for a sketch, either!"